1 of 4 Refrigerate all peanut butter cups for 15 minutes to chill (this makes for easier handling and unwrapping). 2 of 4 Spoon Royal Icing into a ziplock bag. Press out excess air and seal bag. Line a cookie sheet with wax paper. Unwrap peanut butter cups and place on prepared cookie sheet. 3 of 4 Snip a small (1/8-inch) corner from bag with icing. Place a miniature peanut butter cup bottom side up on work surface. Pipe a dot of frosting on top and attach one standard-size peanut butter cup bottom side up. Pipe a wavy line of vanilla frosting around top edge, allowing it to hang over edge. 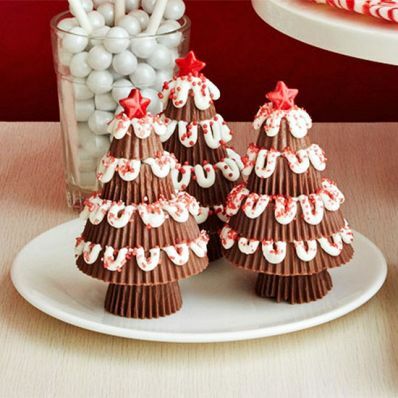 Add a snack-size peanut butter cup and repeat with icing, stacking with a second miniature cup and finishing with a mini cup, to make a 4-layer (5 with the base) Christmas tree shape. 4 of 4 Add a star candy to top and scatter some sprinkles over tree. Repeat to create 11 more peanut butter cup trees.